Fairytales and Fitness: I've earned it but now it annoys me. I can't even count how many 5ks I ran before they started giving out medals for them. Ii agree with you, a 5k medal is questionable. My first half had no medal and only the first 100 to register got a shirt so I have nothing. I would have like a medal from my first half just as a memory. That's weird that certificate is so hard to print. That stinks that you didn't get a medal to commemorate your first half. I have issues with races handing out 5k and 10k medals, which I've written about (and taken heat for). I know for a lot of people, running and lining up for any distance is a big deal, but I still don't think it's worthy of a medal. Just my opinion. I do believe 5k and 10k races are indeed medal worthy, they just don't need to be as large as a marathon medal.lol. But I guess size is relative since some marathon medals are not large. I agree, a medal for a 5k is a bit much but it IS always fun to walk away with SOMETHING after a race. I'd say a tee shirt is more fitting! I will never complain about getting a medal after a race. I do like it! If I had never ran a marathon or any other long distance race I'd think this 5k medal was just fabulous! When I look at my medals, I am amazed at how big medals have become over the past 10 years. It doesn't annoy me, just an observation. I am always amazed when I see people get medals for 5k's... but then I think once you run, you realize that 5k's are just such short distances & you forget so many people are striving so hard to reach that level & its a big deal... so I guess its good there's amazing medals for 5k's. 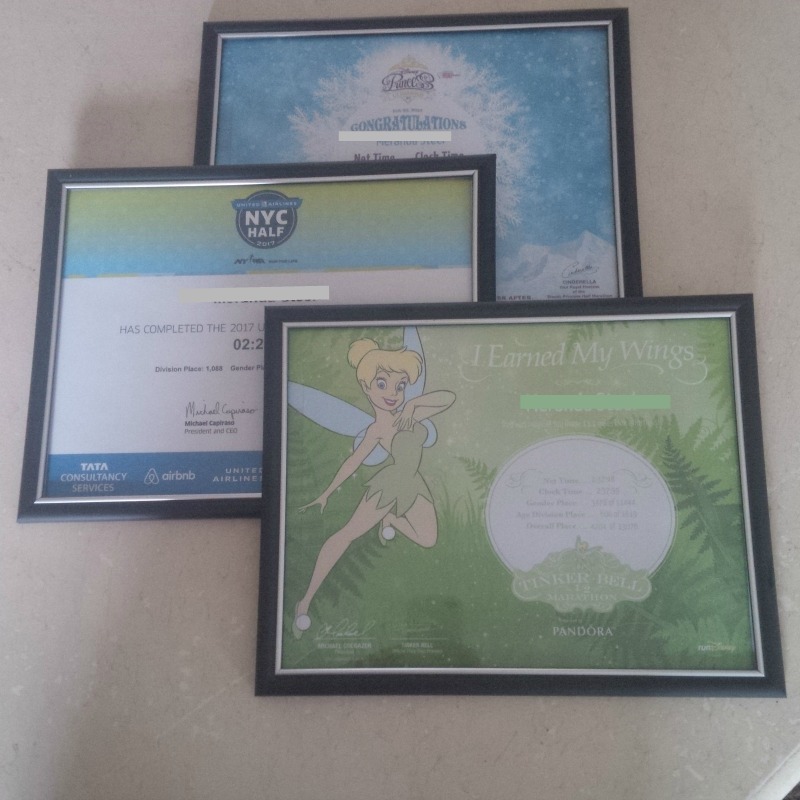 I love printing my certificates. I actually wait for them to be available online. I only do long distance races and one day I will run out of room I'm sure! I see what you mean, but I think a race is a race and accomplishments should be celebrated regardless of how small they seem. As a marathoner, I get it, but I would hate to think that a triathlon finisher would look at my marathon the same way I look at a 5k. Perspective I suppose. 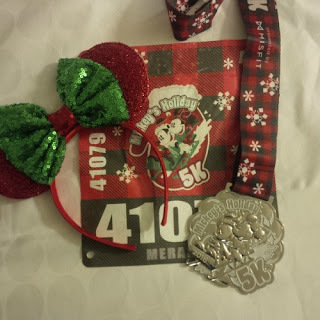 I think the Disney races cost so much so I will not be complaining about an extra medal. Haha! You are SO right! It really is all in perspective. Disney medals are just huge no matter what. 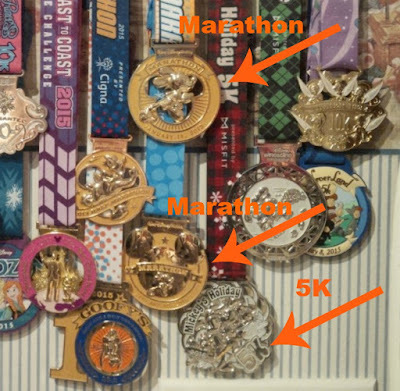 One of the reasons I only display my marathon medals. Its nothing against a shorter distance. They are all great and get people active. But I can't stand the everyone is a winner mentality and everyone gets a trophy thing. People can be proud of any accomplishment I don't think they need a medal to be proud. But medals sell races and races especially Disney are all about the money not so much the competition, its a changing world. My thesis I am working on will be taking part in that world as funny as it sounds. Meaning the medal part lol I'll have to tell you more about it another time. But ya I get what your saying about your 5k medal. I guess that's where our memories and what we actually put into a race come more into play than any medal we received for finishing. 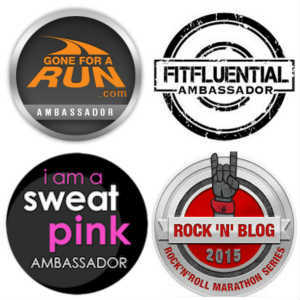 My annoyance is I've run TONS of 5K's and never have found one (locally at least) that goes just a finishers medal for one! My friends that run in bigger cities get medals for all the races... I'm a little jelly! lol! But that's ok! I think it's fine to give a medal for a 5K bc for some people that is the longest or hardest race they will complete. Why should they not feel the same sense of accomplishment? I know some people feel like only the top runner's should get a medal at a race, but since we all pay the same amount to be in the race we should all get something especially if the race is expensive like a runDisney race. The people who place usually get something additional don't they -- like a trophy or a second medal? 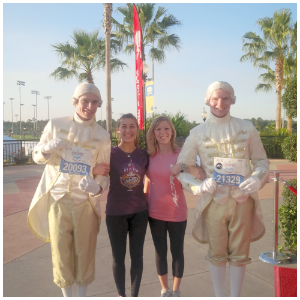 I remember Megan did when we did the cape coral half! Most 5k's I run don't even give medals, and I like it that way! I've never printed out a certificate, and I don't display medals from anything shorter than a half -- and I also have very few of them anyway. Not that many races around here give out medals for the shorter distance. I think they're great for people who have just ran their first race -- I probably would've displayed the one from mine, if they had them. I'm not really all about the bling, anyway. I like nice bling as much as the next person, but it's not what motivates me. I much prefer some nice swag, but you're lucky to get ANY swag these days it seems. I don't think a medal is necessary for a 5K unless you won the thing. I can remember being very proud when I ran my first 5K- I did pick the Gasparilla 5K knowing I would get a small medal, it was a lot of motivation for me to run the whole thing and not stop. I think Disney goes overboard! But maybe if I had stuck to 5ks, they wouldn't feel so cheap. And when I can finally race again and do a 5k and hopefully get a medal at the end, I think that will mean a lot to me. So maybe it's just about where you are in your running career that decides any medal's value.